Present state: The original side platforms and the later island platform are are all extant. The original station building on the 'up' side platform has been converted into a house. The 'new' station building on the island platform provided as part of the 1935 'new works' plan still stands and a stairway with a locked gate gives access to to the northern line station concourse below. This is very occasionally used for public access on 'open days'. During the 1970's she station site was heavily overgrown but this has now been cleared and plastic sheeting covers part of the trackbed above the northern line concourse to prevent water seepage. The trackbed at the west end of the station has been infilled up to platform level. 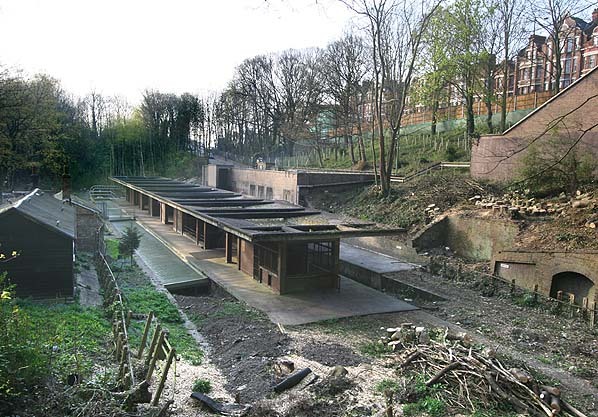 The four tunnel mouths are gated with occasional access to the east tunnel winch is used by roosting bats. Artists impression showing how Highgate Station was to be incorporated into the new Northern Line complex. 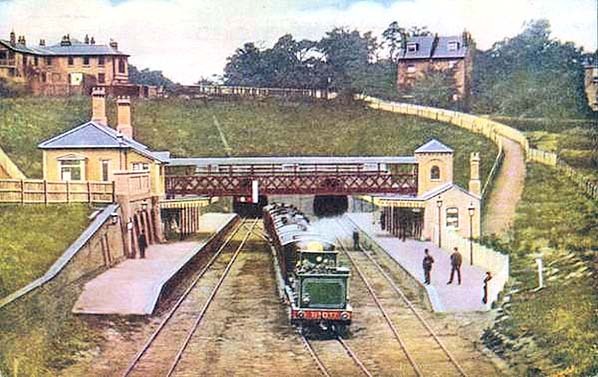 Notes: Highgate Station was sited in a deep cutting immediately west of the Highgate East tunnels and when opened in 1867 it had two side platforms with the main station building on the ‘down’ (south) side at the end of an approach road and a waiting shelter on the ‘up side’. A passing loop was provided between the running tracks to accommodate trains that terminated at Highgate. A covered footbridge ran from the upper floor of the entranced building to a brick ‘tower’ on the up platform adjacent to the shelter. Immediately west of the station the line entered the Highgate West tunnels. In c.1868 an additional entrance was provided high above the station on Archway Road. The station was rebuilt during the 1880’s with a new island platform on the site of the former passing loop with a new booking office in the middle of the footbridge. 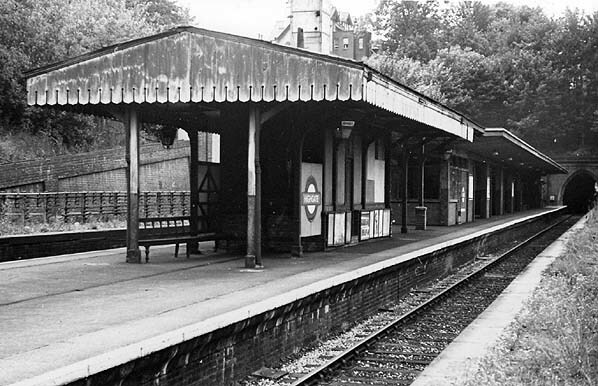 The two side platforms and the original buildings were disused at this time but both platforms and the ‘up’ platform building are still extant today. short section of the 1880’s building including toilets and the canopy was retained at the east end. New entrances were provided on Archway Road and Priory Gardens on the north side of the line with a stairway down from the platform to the Northern Line concourse below. 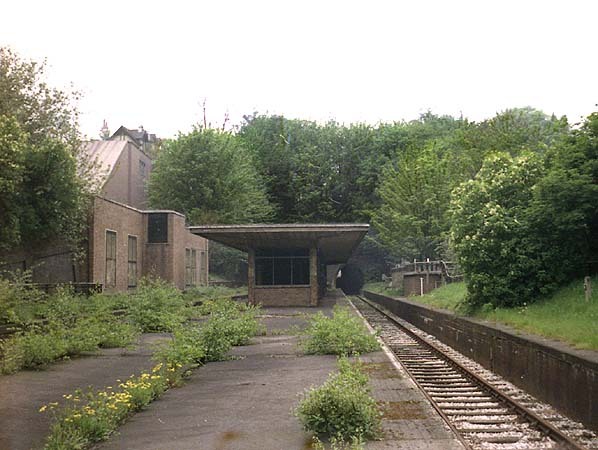 No further work on the station took place after the war with the steam service retained until closure in 1954. There had previously been a short temporary closure between 29.10.1951 – 7.1.1952. Highgate goods depot which was sited beyond the west tunnel remained open until 1st October 1962 but was renamed Highgate Wellington Sidings after closure of the line to passengers. was never built. On the 1st April 1872 the High Barnet branch was opened with the Alexandra Palace branch opening on 24th May 1873; the section between Muswell Hill and Alexandra Palace was still owned by the Muswell Hill & Palace Railway although worked by the GNR. The Alexandra Palace branch was an immediate success providing the most convenient route to the Palace from central London but the services was suspended a few weeks after opening when the palace was gutted by fire and was not reinstated until May 1875. Initially the branch was well used but within a year the MH & PR was in financial difficulty as passenger numbers fell dramatically. Several periods of closure for the terminus followed as the GNR failed to attract residential traffic to the line. In 1911 the Muswell Hill & Palace Railway was purchased by the GNR and although passenger numbers had improved this was halted by competition from the new more convenient tram services. Through trains to central London outside the rush hour were withdrawn during WW1 when a weekday shuttle between Finsbury Park and Alexandra Palace was introduced. Although the full weekday service was restored at the end of the war the branch was never to fully recover and passenger numbers at all stations between Highgate and Alexandra Palace plummeted. In 1935 the London Passenger Transport Board announced their 'New Works Plan' which included a proposal to take over the ex-GNR line between Finsbury Park and Edgware and High Barnet, including the Alexandra Palace branch. These would be incorporated into the Northern Line with a new connection with the Northern City line at Finsbury Park providing a fast and frequent service of electric trains into central London. London Transport had every intention of completing their New Works plan and although several lines, including the Alexandra Palace branch were shown 'under construction' on some underground maps until 1950 work never restarted.On 3rd July 1939 the existing northern line service was extended from Archway to East Finchley where it surfaced alongside the LNER line from Finsbury Park just south of the station. The steam trains which formerly served High Barnet and Edgware was cut back to East Finchley and after March 1941 all trains were diverted to Alexandra Palace instead but this improvement in service was short lived with all through trains were withdrawn and once again replaced by a limited shuttle. 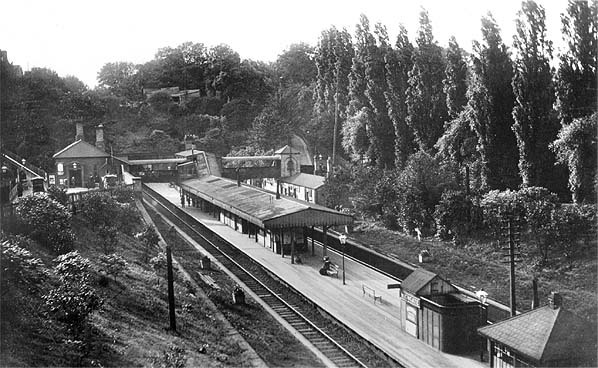 Highgate Station looking west in the early 20th century - during the 1880's the two side platforms were replaced by an island platform on the site of the former run round loop. During 1940/41 the a new station building was provided as part of the 1945 'New Works' plan to incorporate the station into London Transport's Northern Line. The east end of the 1880's building containing toilets was retained. Note the London Transport 'bullseye' sign. Highgate Station looking west in May 1968 - by this date the 1880's toilets had been demolished leaving the 1940's building standing. Highgate Station looking east in April 2007. Parts of the trackbed have been covered by plastic sheeting to prevent water seepage into the northern line concourse below. The original 1867 station building can be seen on the left.